Paul Zerdin is a ventriloquist with a difference & state-of-the-art puppets! Paul Zerdin appeals to both comedy club and mainstream audiences in equal measure. The UK’s number one ventriloquist’s career has included appearances on everything from the Royal Variety Performance, Paramount and Comedy Central’s, The World Stands Up to ITV Daybreak, BBC TV’s The One Show, Sky News and Jason Manford’s Comedy Rocks. 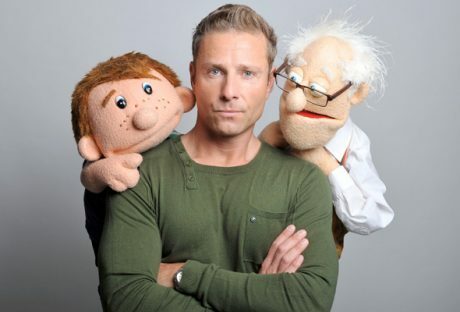 With Paul’s winning combination of technical skill, hilarious ventriloquism, charm and impeccable comic timing, Paul Zerdin’s live shows see him bring to life several very different characters amongst whom are the cheeky pre-adolescent Sam, belligerent OAP Albert and precocious infant Baby and in 2012 on his Puppet Master live tour, Paul introduced a new character! “I see myself as a one man Muppet sitcom, reigning the characters in” commented Zerdin. “The old man has a thing for the ladies and so does Sam who is about to become a teen and knows naughty words. Between the two of them they lead the baby astray and the baby, of course, wants to know everything. I think it is important to have characters that people can relate to rather than, say, talking sheep which are less believable”. Zerdin, who got the ‘biggest laugh of the night’ at the Royal Variety Performance in 2009, according to audience members, also went on to get 5 star reviews at that year’s Edinburgh Festival. Paul returned to Edinburgh to sold-out houses in 2010 and made his debut at Montreal’s Just For Laughs Festival that year before embarking on a major UK tour with Sponge Fest in 2010/2011. Having failed his GCSE’s in spectacular style, Zerdin got a job in a magic shop, developing his magic skills along the way. Simultaneously, he was also developing a sideline as a children’s entertainer. By the late 90s it was obvious that traditional variety shows were losing their appeal and it was then that Zerdin decided to introduce stand-up into his routine, a decision that has paid off handsomely. To enquire about or book Paul Zerdin for your event contact Arena Entertainment. Either send an email to info@arenaentertainments.co.uk or speak to one of our booking agents on 0113-239-2222.